Recently I caught up with the GMS 2 game developer responsible for the fantastic looking Santria, a work-in-progress light-hearted RPG made by @schottidev. I’m a polymer chemist, who is about to finish his PhD thesis. Therefore, I’m developing Santria in my spare time and every free minute I can spend. The possibility to work full-time on Santria would be a dream come true! One of my earliest memories was Super Mario Land on the Game Boy. Pretty hard game for a little boy! Overall, my favorite video games are Link’s Awakening and Grim Fandango. Both games impressed me a lot and shaped my taste in video games. Santria is my first big project with the goal to release it on platforms like Steam or GOG. From time to time I participate on a game jam to try new concepts and improve my dev skills, but this small prototypes are not worth mentioning. Tell us a little about Santria and where the inspiration for the game came from. Santria is a light-hearted, modern-setting RPG with a strong emphasis on exploration and character interactions. I’m attracted to games with quirky and modern settings like Earthbound or Pokémon. These kinds of games have a very appealing mood to me, combining serious and humorous moments in a world familiar to ours but with an interesting twist. I’m also big fan of community simulation games with a huge chunk of social interactions and various activities like Animal Crossing or recently Stardew Valley. I try to capture these influences in Santria and mix it with some Twin Peaks and X-Files vibes. Another key feature in Santria is the tactical battle system, which will be also used as a storytelling device, making battles more interesting. How many are in the team developing Santria and who are they? Santria is primarily developed by me with some help in art by Sabaku (@sabbi_tabbi) and with a fantastic soundtrack by my composer Claudi Martinez (@claudimusik). Follow them, great personalities! Why did you choose to use GMS2 for this project? As mentioned above, GMS2 is an accessible and flexible engine, suitable for the fast prototyping of gameplay elements. Time is a very limited resource in solo projects so I have to use it very efficiently, especially for a more or less complex roleplay game. 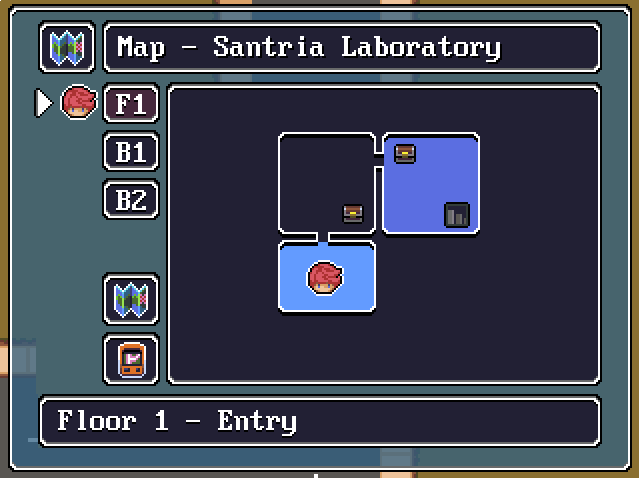 Thanks to GMS2, I can put a lot more time into important aspects like level design and details. GMS2 is a huge step in the right direction. Almost every aspect of the IDE was improved and the performance and workflow is so much better. I can only recommend to move on! Aseprite for pixel art, I’m in love with this software! LICEcap to record gifs for twitter. I’m using a desktop PC (Intel i5-6600K CPU, Nvidia GeForce GTX 970, 16 GB RAM) with two screens. Two screens are very handy for a fast workflow! Do you have a date that you’re working towards for release? I try to release Santria in the end of 2017, maybe supported with a Kickstarter to allow me to speed up the development and target more platforms. What platforms will we see Santria on? At the moment, only Windows and Mac. What top tip do you have for aspiring game developers getting started with GameMaker? Just do it! GMS is a very accessible and effortable engine. Play around and gain experience! Hyper Light Drifter, Undertale and Stardew Valley! Check out umaikigames.com, a network of friendly indie gamedevs working on their dream projects and supporting each other with advices and stuff. I’m proud to be part of it! If you are interested in the Santria OST, check out the tracks on www.claudimartinez.com/santria, too! Last but not least: I use twitter very frequently, a good spot to be up to date regarding Santria development. I’d like to say a huge thank you to @schottidev for taking the time for this interview. The game looks amazing and we’re enjoying the regular updates on Twitter. Grab Aesprite, the developer’s pixel art tool of choice, here. Check out LICEcap for creating GIFs here.